Free Setup! Our 2"x 2" custom temporary tattoos are printed in full-color process, so your possibilities are practically endless! Temporary tattoos are fun for parties, community events, grand openings, event swag bags, theater premieres and more. Fun for all ages! Website was easy to use. There were clear descriptions and photos of the finished product. This is my first time doing this. It is an inexpensive test. Right price for the size and quality. Like the size & is for an event. HAND THEM OUT TO CUSTOMERS KIDS. THEY LOVE THEM! We are exhibiting at a 3-day Paddling Festival. The 2x2 full-color tattoos are a colorful, affordable, large qty. item we can personally hand festival patrons. FUN FOR ALL TO WEAR! We ordered for a different event earlier in the year and people loved them. Great quality and quick production/delivery. Good luck in the past and a fun thing for our guests! I compared prices and printglobe had the best prices per item as well as no set up charge. Will be definitely ordering more from this company. This tattoo lasted more than 3 weeks and still looked good. Thank you! What a cute kiddo! Thank you for sharing! 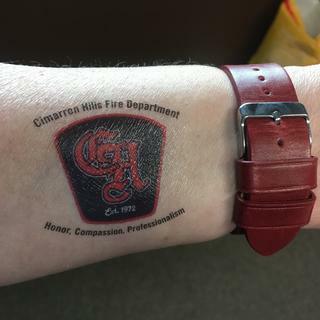 We created a custom tattoo for the kiddos attending our annual Fire Department events. It has been an absolute hit. These tattoos are quality made and they don't rub off. (Took makeup remover to get one off my hand). Our experience - Great price and great customer service. We love how these came out, too! Thank you for sharing! 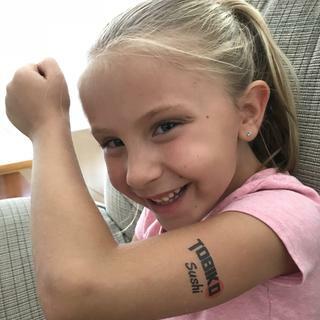 We are so happy to hear the tattoos were a hit at your events! We are so grateful for First Responders so from all of us at PrintGlobe, thanks!!!! My medical temporary tatoos are great for my job as a swim instructor. They last through up tofive hours in the pool and that includes my own swim workout! Sometimes I don't need to re-apply one the next day-it still looks perfect! Thanks Printglobe! We used these for a workshop retreat. Had custom logo done and it came out perfect. It worked out well to brand our business. These were well received and simple to apply. They last very well with multiple showering and swimming. They are also easy to remove. These work really well. My only disappointment is that they were smaller than I expected. I guess due to the required border, but a 2" square really ends up only being 1-3/4" square. Hi Rick, thank you for your review and feedback. We are glad to hear you are mostly happy with the product, and sorry to hear you're disappointed with the size. This feedback is certainly useful for us though, so we appreciate you taking the time to leave a review! Thanks again, and we look forward to working with you on your next project!